Each Friday, ADAPT Community Network hosts a Friday Night EXPLORE Club Disco for adults who participate in our day programs. This night is a fun opportunity for people we support to socialize with others, form lasting bonds and enjoy dancing, dining and mingling. On October 26th, the Friday Disco event had a “Spooktacular” Halloween theme. The partygoers, dressed in Halloween costumes, enjoyed a festive dinner, dessert and dancing. Our individuals wore imaginative, beautiful costumes, such as clowns, cats, vampires and cartoon characters like Minnie Mouse. 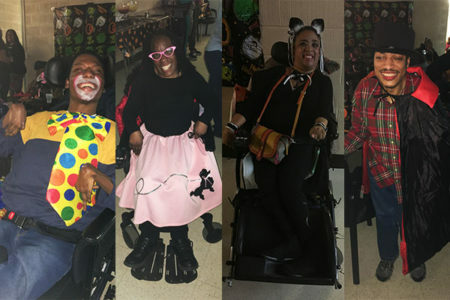 They enjoyed listening and dancing to Halloween classics such as Monster Mash and the Ghostbusters theme song, and during the last hour they enjoyed all varieties of music that they like. The walls were decorated with spooky laboratory back drops, jack o’ lanterns and bats. The participants all went home with goody bags at the end of the night.